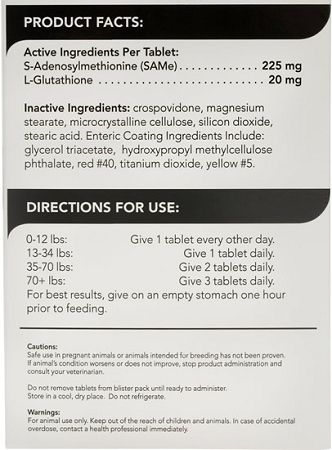 Vetri SAMe 225 contains both SAMe (S-Adenosylmethionine) and Glutathione to provide advanced liver support for dogs. 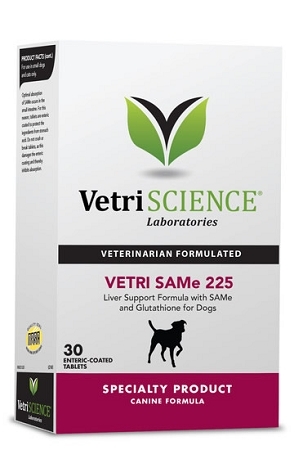 Vetri SAMe 225mg for Dogs - Supports Optimal Liver Function in Dogs. S-Adenosylmethionine (SAMe) supports liver function through the formation of glutathione. Glutathione is a powerful antioxidant and plays a major role in the detoxification of drugs and toxins in the liver. This formula combines both SAMe and Glutathione to provide advanced liver support in dogs and cats. SAMe is involved in many biochemical reactions in the liver, including detoxification. SAMe reduces the amount of fat in the liver. Fat is a leading cause of impaired liver function. Glutathione works to reduce oxidative damage to liver cells that are caused by some medications. Glutathione protects liver cells from toxins. Vetri SAMe also supports cognitive function by balancing the activity associated with brain neurotransmitters. 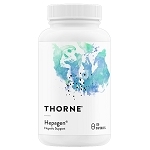 It enhances the binding of neurotransmitters to receptor sites within the brain, resulting in increased activity of serotonin and dopamine. Nearly 100 published studies have shown the effectiveness of SAMe as a mood enhancing ingredient. Vetri SAMe tablets are enteric coated to protect the ingredients from stomach acid and to ensure that they are delivered to the small intestine where SAMe is best absorbed and utilized. Each box contains 30 enteric coated tablets. Vetri SAMe 225 mg is for dogs. For small dogs and cats, see Vetri SAMe 90 mg.
Enteric Coating Ingredients Include: Glycerol Triacetate, Hydroxypropyl Methylcellulose Phthalate, Red #40, Titanium Dioxide, Yellow #10. Vetri SAMe 225 mg is for dogs. For small dogs and cats, see Vetri SAMe 90 mg.
For best results, give on an empty stomach, one hour prior to feeding. Optimal absorption of SAMe occurs in the small intestine. For this reason, tablets are enteric coated to protect the ingredients from stomach acid. 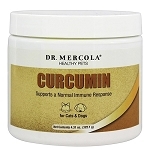 Do not crush or break tablets as this will damage the enteric coating and thereby inhibit absorption.